On safari in Europa? It’s possible! 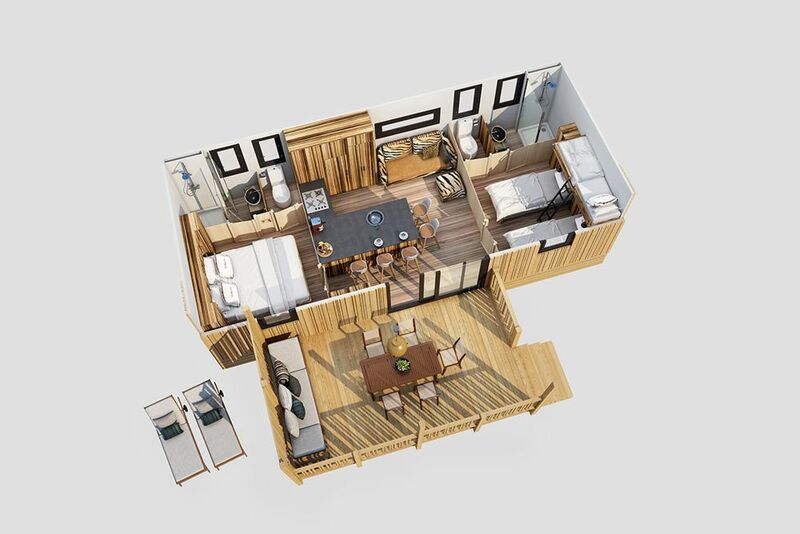 Just take a look at our brand new SunLodge Catalpa (no less than 52m²!). Adventure will come your way while you have comfort and luxury at your fingertips. How about an island kitchen, two bathrooms with rain showers, airconditioning and a lovely patio? And that patio; it’s the perfect place to relax completely. Have your breakfast on the large wooden table in the morning, then in the afternoon you can relax in the sun on one of the loungers, while the children play around the large DuoLounger. Inside it’s just as though you were on an adventurous safari. The floor has a beautiful bamboo effect, the furniture has stylish zebra wood finishing touches and the lounge sofa and pouffe have a velvety animal print. Posters on the wall provide the finishing touch. You can almost hear the roar of the tigers Well, even that’s possible! You can always play your favourite music through the Bluetooth system. Can you picture it? All of you enjoying delicious food and drink around the island kitchen. Discussing what great things you’re planning for tomorrow, without having to worry about the washing up because that takes care of itself. You’ll have plenty of time for each other and for yourself. And at the end of every day of your holiday there will be a comfortable bed waiting for you, with a deep mattress and fine cotton sheets. The next day starts with a wonderful hot rain shower in the morning. And with two bathrooms, you might as well stay under it for a couple of minutes longer - it’s a holiday, after all!